A simple yet spacious home for your family may be the ultimate living goal for you. 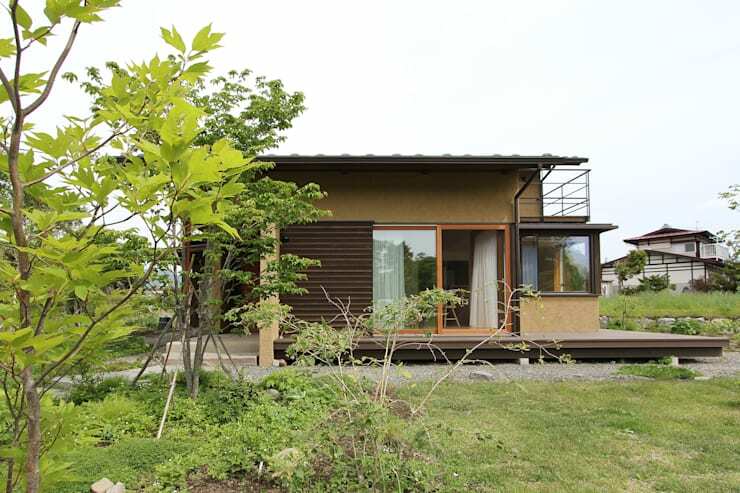 This modern home is elegant and attractive, but also enjoys the simple things such as natural materials and fresh air. The home is beautiful and comfortable, surrounded by a stunning rural location, which allows you appreciate the finer things in life, such as family time, the environment and simple living. The architects of this wonderful bungalow took all those aspects into consideration when planning the layout and design of this gorgeous structure… let’s begin our virtual tour, shall we? 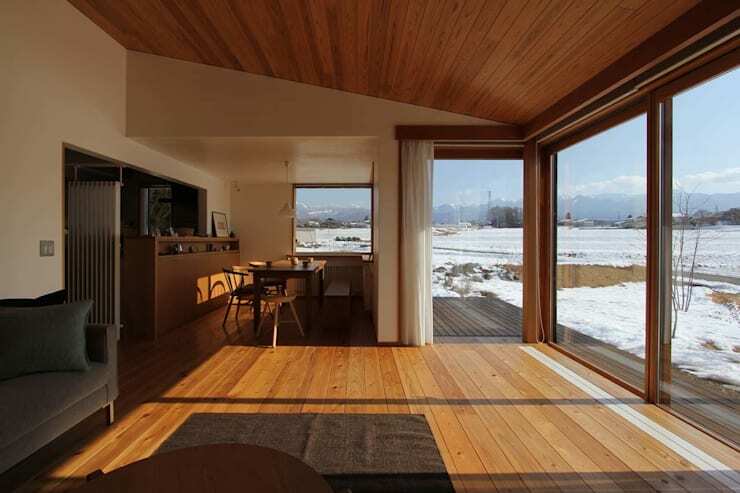 The earthy colour of this home displays the love for fresh air and natural sunlight. The sliding doors allow for the exterior to quickly become an extension of the interior. Outdoor living, the lovely garden and subtle tones of timber makes this home an eye-catching structure with a modern minimalist architecture. 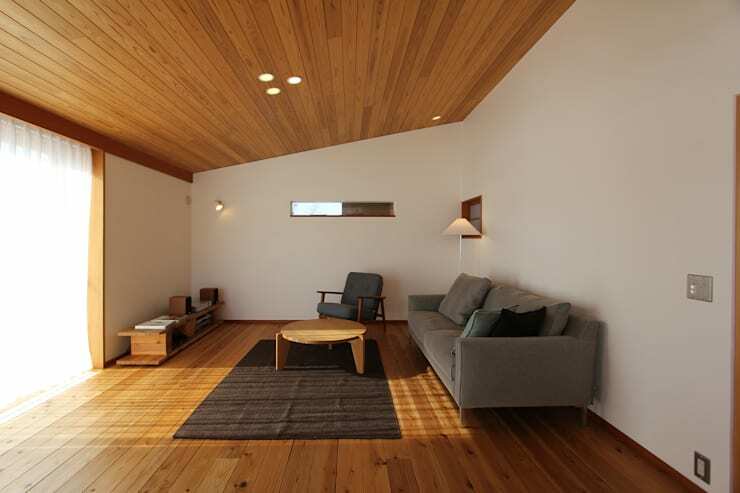 The living room of this home has a nature loving atmosphere, this is displayed by the wooden floor and ceiling as well as neutral colours that create a warm and cosy environment. The minimalist décor and open plan environment is spacious and comforting. Enjoy a view of the exterior from the comfort of your sofa, or draw the curtains for privacy. The living room forms part of the dining area of the home, showing just how spacious this interior is. But the neutral colour of the walls and flooring, along with the glass doors enhances the amount of natural light entering the space. The angled ceiling creates a cosy feeling in the dining area of the home, while enhancing that warm homely environment too. The dining zone of the home is located next to the kitchen… which is up next! 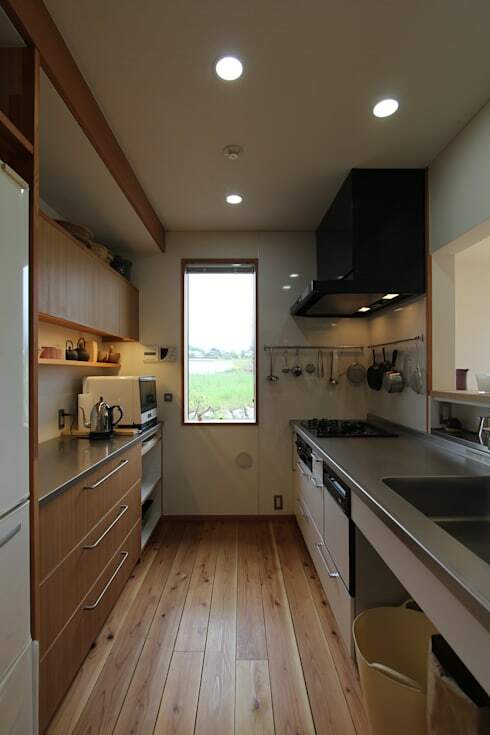 This wooden kitchen is the perfect addition to this nature inspired home. Although this type of décor typically has a rustic ambiance, the wooden kitchen here is a great choice for this minimalist modern home. The kitchen is separated from the dining room, although the material compliments the dining table. It’s a home that’s great for entertaining and socialising, but wait until you see inside the kitchen. 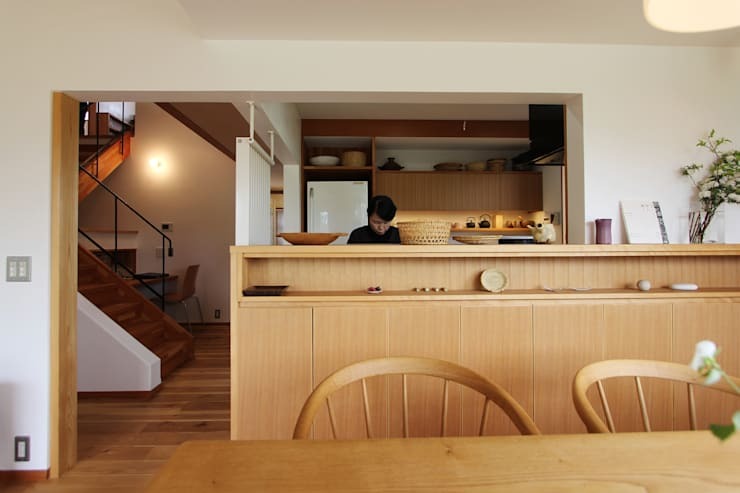 The kitchen has a dynamic galley-style kitchen with wooden floorboards reflecting the lines of the two opposing counter-tops. The kitchen is simple, with a gorgeous geometric unity. The design contrasts in parts with the rest of the home décor, while certain aspects also quietly blend in with the overall aesthetic of the home. The kitchen is functional with a variety of storage spaces, from sliding storage cabinet doors, to open storage, high storage and even wall storage as well as a large double sink. We have come to the end of this Ideabook. However, we need to have a final look at the bathroom. 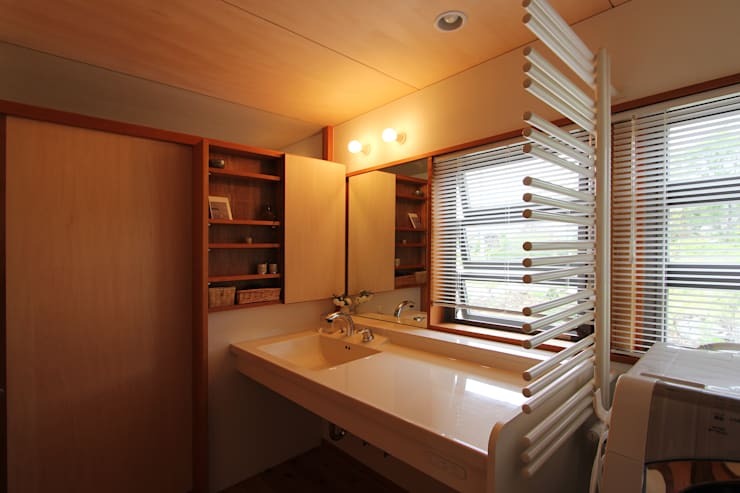 Its wooden décor is a wonderful choice, as it allows for consistency between other parts of the home, and the bathroom. The bathroom is spacious and sultry with neutral colours and romantic lighting for a comfortable serene space of luxury and style. The natural lighting adds a warm and cosy effect, a must-have to any modern bathroom. If you loved this stylish rural home, then you'll adore: A dream home perfect for a South African family. Would you like a home that enjoys the simple things?